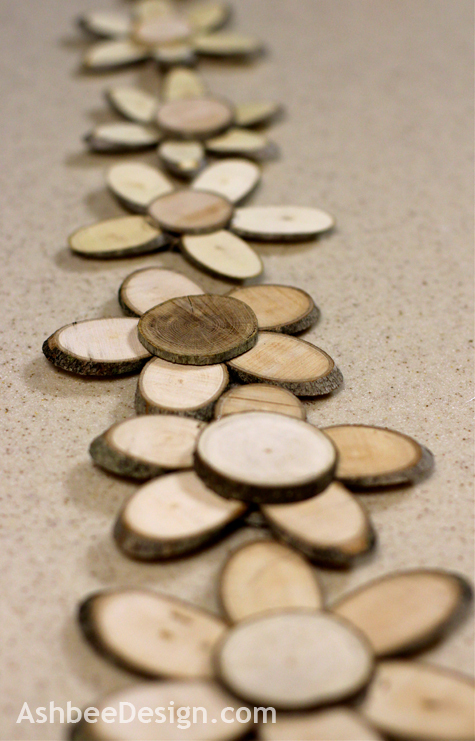 What if I took five, glued them together in a radial arrangement with two center disks and made a woodland flower? Oh yes. These are quite nice. I proceeded to make a collection. And hang them in the spaces of my branch screen. Update: I did make them for my branch ladder - in fact I explored the concept further and made more intricate designs. Click through to the post for more info and additional tutorials. Here is a quick run down of the process I used. I am looking forward to doing more with this technique. I can see a plethora of possibilities here! Sliced the branches into 1/8" slices. They don't need to be perfect but not too wavy either. Make a variety of slice angles but for each angle, cut similar ones in groups of five. 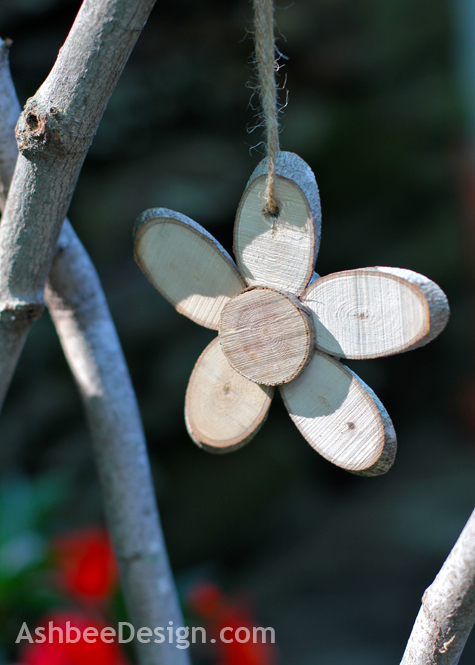 By cutting the branch at a diagonal you create elongated ellipse forms which work well as a petal shape. 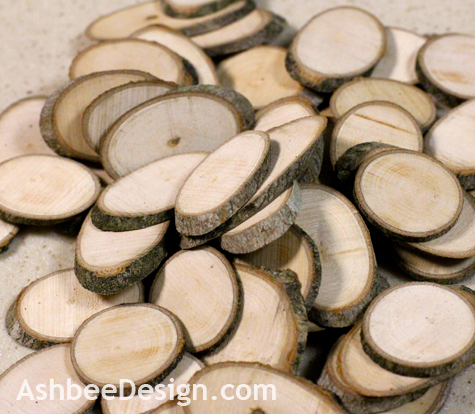 Also cut some round disks to serve as flower centers. You will need two for each flower. Allow these to dry. It depends on how green or wet the original wood is. Hot glue doesn't work well on wet surfaces and you will minimize the cracking of the disks if you let the dry over time. I had some that had been drying for a week and some that I'd cut in the morning. The glue didn't hold well on the morning samples. Arrange the disks in groups of five or six. Heat up the glue gun. 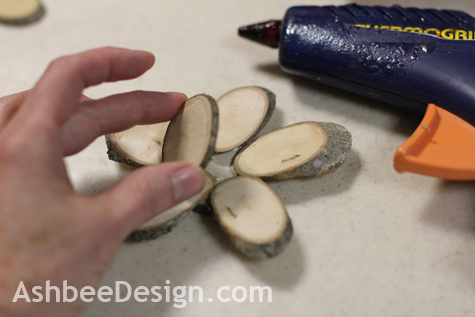 Put a line of glue on the flat side, around the entire edge, of the center round wood slice and press it down onto the center of the five petals. Work quickly so that the glue doesn't harden before you get it into place and apply pressure for a few seconds. 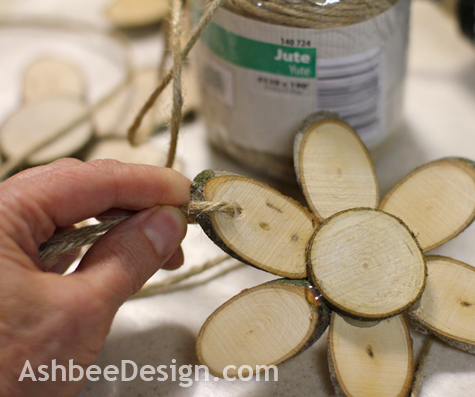 When the glue has hardened, flip the flower over and add a second disk to the back again using hot glue. Press it in place and hold for few seconds. 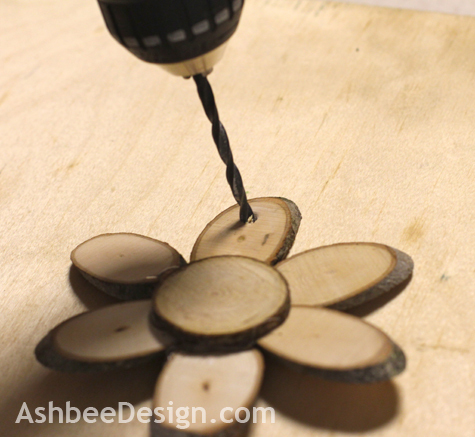 Using a power hand drill and a 3/16" bit, drill a hole into one of the petals in about 1/4" from the edge. Cut a length of jute and thread it through the hole knotting the two ends together about 6" out to create a hanging loop. 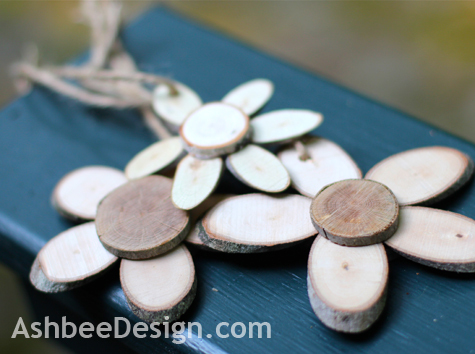 Make them in various sizes, some with five petals and some with six. And find a place to hang them. Wondering if I should finish them with polyurethane or just let them weather. Time will tell! Somehow I love this idea better than the candles'. Not that the candles weren't a great idea - I still have to see one from that isn't ;) - but not being real candles remove some of the beauty in my opinion. Though I understand the "why not" but these flowers keep the natural and Earthly Theme closer. Love it and you're right the use for them are endless... and lovely. I mentioned your blog in my blog. If you wish you can visit me and see why. I agree with you Theresa, but what I like most is the ability to change out what is displayed on the fence -candles one night, wood flowers the next, colorful origami cranes another time. The ideas are endless and I've given myself another place to display. Oh my gosh those are FANTASTIC! Love! Pinning! Nature and a bit of rustic are my favorite. I seem to be centering in on nature and rustic as a recurring theme on my blog. Interesting. I expect it is because of the endless inspiration all around me. Pinning! These would make great Christmas ornaments too. I haven't seen the large ones, but I am going to try some variations for other locations, and adding branch stems to make a centerpiece as well. These are so pretty. I think they would make great Christmas ornaments, too. They are so pretty. If I can make a suggestion, I would use wood glue instead of a glue gun. 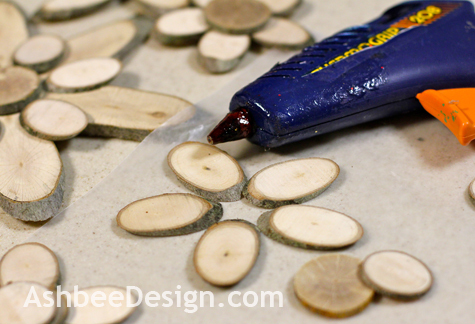 Wood glue will hold really well if the slices are dried out, glue gun glue tends to get brittle and pop off, it cannot take cold weather very well either. Thanks for the advice. 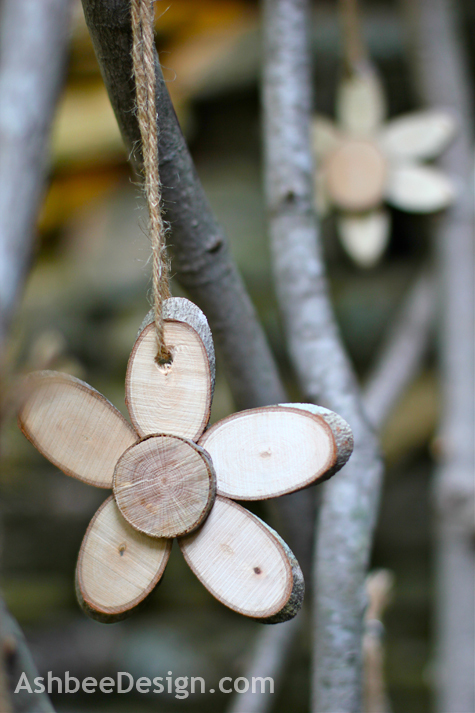 Do you know of a wood glue that dries quickly and doesn't require clamping? Very creative use of natural materials! 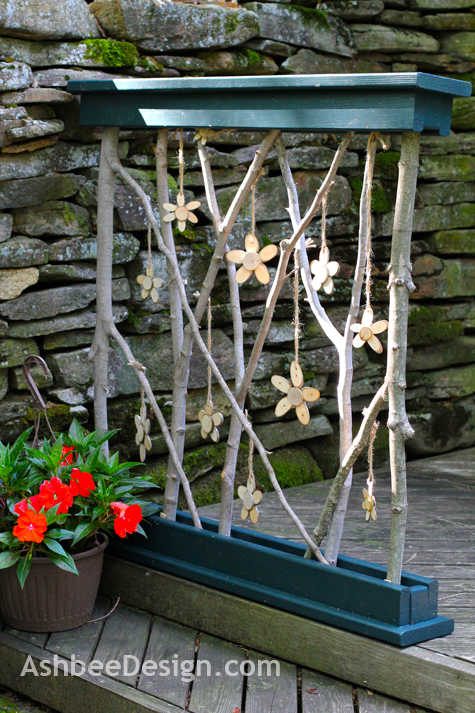 I adore the flowers and absolutely love the twig screen! I seem to be on a roll with natural materials. Lots of inspiration in that direction. Must be because it is summer time and I am outside a lot! Thanks for stopping by and commenting. Love the flowers and how you get the added texture of their rings in the flower. Very cute! The texture is caused by the band saw cut. I used a fine metal blade. The rings are a natural part of the tree branch. No input required by me. Thanks for visiting and commenting. This is so, so cute! I'm pinning it!! Thanks! Love Pinterest and love sharing. Too cute for words!! I love using natural items! JoAnn, Thanks for visiting and commenting. Just visited your site and saw your seedpod stars. Loved them. Sooo PRETTY!!!!! You're the best! CONGRATS!!! You have been Featured at The DIY Dreamer.. From Dream To Reality!! Come on over and grab the featured button :) You deserve it! Love it!! The flowers are beautiful as they are natural!! Thanks for linking up at Romance on a dime's TIOT party!! Pinning this. I've been really impressed by all that you have done. Thanks Betsy. Work continues on new things but no partying this week. Last week was vacation and no projects!